This article was originally published on Tech.pinions, a website dedicated to informed opinions, insight, and perspective on the tech industry. There’s been a lot of talk recently about Millennials leaving Facebook for Snapchat. We at Creative Strategies recently surveyed over 500 college students across the US about the apps they use, how often they download new apps, and more. It turns out, there’s some truth to the “Facebook is losing millennials to Snapchat” narrative, but that argument misses the larger point. 22 percent of millennials say Snapchat is their favorite app, compared to 10 percent for the Facebook app. However, 33 percent of millennials say a Facebook-owned app is their favorite. When you factor in Messenger, Instagram and WhatsApp, Facebook (the company) dominates. The same dynamic applies to the apps millennials use most. 58 percent of millennials say Snapchat is among their top three most used apps, compared to 51 percent who say the same thing about the Facebook app. But once again, when you factor in Messenger, Instagram, and WhatsApp, Facebook dominates. 84 percent of millennials say a Facebook-owned app is one of their top three most used, compared to 58 percent for Snapchat. We also learned the Facebook app is the largest digital driver of new app installs. 47 percent of millennials say they learn about the new apps they download from Facebook, double the percentage of those who learn about them from Twitter. The only thing millennials rely on more to discover new apps is direct advice from their friends. Facebook has definitely not lost its hold on millennials. Our survey also taught us how much millennials pay for apps and in-app purchases. 90 percent of millennials usually download free apps. 99 percent — yes, 99 percent — usually download apps that cost $1.99 or less. One percent usually downloads apps that cost $2 or more. The story is the same for in-app purchases. The vast majority of the in-app purchases millennials make cost $1.99 or less. A final thing our survey taught us is how frequently millennials download new apps. Only 17 percent of millennials download new apps more frequently than once per month; 12 percent downloaded a bunch of apps when they got their phone but haven’t downloaded any since. We asked millennials what app they’ve downloaded recently that they really like. Interestingly, except for Pokémon Go, an outlier of outliers, almost none of the apps millennials have downloaded recently are among their most used. Put it all together and the picture is clear: Millennials already have and use the apps they need and they aren’t actively seeking out new apps anymore, certainly not “expensive” ones. Gone are the days when millennials downloaded new apps for the fun of it. The app craze is over. Apps aren’t the exciting new thing anymore. This isn’t to say all millennials have stopped downloading apps. That’s ridiculous and not true. It’s just that millennials download apps far less often than they used to and, for the most part, they no longer actively seek out new ones. The apps they’ve already downloaded satisfy their needs. This bodes poorly for companies trying to get millennials to download and use new apps. Millennials have decided their needs are already met. It will take a very special company to convince millennials they have a need they don’t yet know about. This article was originally published on Tech.pinions, a website dedicated to informed opinions, insight, and perspective on the tech industry. It was then republished on Recode. Can we just take a second and recognize what a god damned miracle Google docs is? The collaboration tools are ridiculous. Throop surely wasn’t trying to, but he actually expressed the sentiment of US millennials. We at Creative Strategies recently surveyed over 350 students at more than 40 colleges across the country. It turns out that they, like Throop, love the collaboration Google Docs enables. When students write papers by themselves, only 12 percent use Google Docs. But when students write papers in groups — when they collaborate — 78 percent use Google Docs. On the other hand, 80 percent of students use Microsoft Word for individual work and 13 percent use it for group work. The dynamic is the same for all millennials, regardless of gender, the phone they use, or where they live: Microsoft Word for individual work, Google Docs for collaborative work. Through qualitative and quantitative interviews, we learned this behavior is firmly entrenched. Not even losing important files in a computer crash prompts millennials to start using Google Docs for individual work, even though doing so would prevent future file losses. There is so much behavioral debt associated with using Microsoft Word for individual work, not even a catastrophic event can overcome it. Millennials are similarly loyal to Google Docs for collaborative work. In our qualitative interviews, we asked students how they would collaborate if they couldn’t use Google Docs. Many had emotional reactions. One person responded with five seconds of silence, another with a solemn, “I would be very sad”. Needless to say, it was shocking to discover that millennials are emotionally invested in a word processor. That’s just some of what we learned from our study and it has many important implications. As millennials continue to join the workforce, they’ll be frustrated if they have to use Microsoft Word for collaborative projects. They’ve grown up using Google Docs because of the real-time collaboration it enables and, to them, it would be a giant step backwards to email files back and forth. Additionally, the fact millennials’ behavior is so entrenched is both good and bad for Microsoft and Google. Microsoft owns individual work and Google owns collaborative work but each company definitely wants to own the other’s domain. However, because millennials’ behavior is so entrenched, it’s unlikely either company will convince them to change any time soon. For both individual and collaborative work, Microsoft Word has been older generations’ default word processor for decades. But not for millennials. Microsoft failed to address their collaboration needs, so millennials don’t use Word to collaborate. This illustrates two important points. First, when you don’t meet the needs of your customers, your customers will leave you and go find someone who does. Second, it shows millennials behave differently than older generations do. Ultimately, Microsoft’s failure to address a behavioral change is a lesson others can learn from. Millennials are different and you need to understand their needs and behaviors to successfully build and market products for them. We can imagine a day in the not-so-distant future when your wallet becomes a remnant of the past. Your passport, your driver’s license, and other important documents can be digitally stored in a way that’s safe, secure, and easy to access — but only by you. After all, we shouldn’t have to trade our security for the convenience of having all of this information at our fingertips. As I wrote at the time, that’s Cook saying Apple wants to turn your iPhone into a digital wallet, complete with the ability to store “your passport, your driver’s license, and other important documents” in your phone. But in order to turn wallets into remnants of the past, Apple will have to solve many complex, unacknowledged problems. The company will have to create digital equivalents of everything stored in physical wallets: credit cards, debit cards, membership cards, ID cards, business cards, health insurance information, and cash, among other things. And in order to realize Cook’s vision of an iPhone that also stores your passport and driver’s license, Apple will have to persuade and then work with countless governments around the world. Additionally, the company will have to ensure that others accept what’s stored in its digital wallet. And even then — even if Apple can design the perfect product and ensure 100 percent compatibility — there’s no guarantee digital wallets will be universally used. Apple’s quest to replace the wallet began in 2012 with the release of Passbook for iOS. The built-in app stored things like boarding passes and loyalty cards. Since then, Apple has changed the app’s name to Wallet and integrated Apple Pay into the app, allowing people to pay for things with their phones. Building a way for people to pay businesses was a good first step towards making the iPhone a wallet replacement. The next logical step is to build a way for people to pay each other. And Apple, no doubt, is working on exactly that. However, an Apple Pay-based peer-to-peer payment system won’t necessarily be universally accepted the way cash is. If you owe your friend $20, you can take cash out of your wallet and give it to him. But if your iPhone replaces your wallet — i.e. you don’t use a physical wallet anymore — and you need to pay your Android phone-owning friend $20, then what? You take out your iPhone to send him the money, and then, whoops, you can’t because he doesn’t have an iPhone? This is an issue that Apple will have to address.1 People need to be able to pay each other regardless of what phone they own. Cash is universal; paying people on our phones will have to be, too. Cash is not the only thing that could have compatibility issues. The same issue exists for credit cards, debit cards, membership cards, ID cards, and health insurance information, among other things. Yes, as more card issuers support Apple Pay and NFC card readers become more prevalent, the credit and debit card compatibility issue will slowly disappear. However, Apple will still need to create a method to store membership cards, ID cards, and health insurance information electronically. It will also have to ensure their acceptance. You can’t use your digital health insurance card if your doctor doesn’t accept it. In order to realize Cook’s vision of an iPhone that stores passports, driver’s licenses, and “other important documents” (e.g. Social Security cards), Apple will have to convince governments to allow digital passports and driver’s licenses, and then it will have to work with those governments to create them. The process would likely take years. In the United States alone, the company would have to work with the federal government to create digital passports and Social Security cards, and it would have to work with all 50 state governments to create digital driver’s licenses. Apple would also have to work with parts of local governments (e.g. police departments) to ensure that these digital equivalents are universally accepted. You can’t use your digital driver’s license if the government doesn’t accept it. And that’s just in the United States. Apple would have to do this in countries around the world. There’s also the issue of international travel. What happens if you’re flying to another country, and when you arrive at customs, you realize that this new country doesn’t have a digital passport reader installed? Or if you fly to a new country, arrive at customs, and your battery is dead? In fact, a dead battery hinders everything a digital wallet would do. How do you use your phone to pay a friend, buy groceries, or give a doctor your health insurance information with a dead battery? It would be extremely hard for Apple to address all of these issues, but even if it could, there’s still no guarantee the company would be able to turn wallets into remnants of the past. Some cultures prefer to use cash over credit cards, and some cultures don’t value technology as highly as we do here in the U.S. It’s unlikely everyone will embrace Cook’s vision. This isn’t to say Apple shouldn’t pursue digital wallets. Just because they would be hard to create doesn’t mean Apple can’t create them.2 And just because their adoption would face cultural obstacles doesn’t mean Apple can’t overcome them. It just means that turning Cook’s vision into reality is an incredibly daunting task. But if any company is up to the challenge, it’s Apple. The obvious advantage of physical retail is that you immediately get what you need instead of waiting for it to ship, but I actually don’t think that’s the play here; Amazon would rather speed up the delivery process. That scales to more people and keeps with the company’s advantage in selection and price. Another advantage of physical retail is the ability to try various products out. However, this advantage in particular seems orthogonal to Amazon’s inventory advantage: one store can only hold so many items. Thompson says Amazon’s play is not walking out of the store with your purchase in hand, and I agree. I think Amazon wants to give people a place to see, in person, what they’re considering buying online. I recently did a project for a larger consumer electronics company who depends heavily on US retail. While the focus of this research project was not how people research and come to conclusions around the buying process online, I snuck in a question about it. What I quantified was a stat I already knew. 80% of consumers research online before they buy. The nuance of the next question I added brought deeper clarity. I then asked consumers whether their mind was made up solely by the research they did online or if they went in to a store educated but waiting to make up their mind on their final decision. Surprisingly, only 31% of consumers said they walked into a retail store with a definitive decision in mind for their tech-related purchase. The rest were still ready to be swayed or were looking at several products at one time, and were going to make the final decision in store. Alternately, they could showroom and go back online and buy it once seeing it in store. Bottom line, the retail presence still has value in the decision-making process. Here lies Amazon’s strategy. The book angle is just the start or a cover to a larger, new type of retail experience that focuses more on showcasing technology than pushing sales of technology at the retail endpoint. Bajarin’s last sentence hits the nail on the head — Amazon wants to showcase some of the products it sells on its website in order to convince people to buy them. I’ll take it a step further, though. Amazon wants its retail stores to nudge people into buying products, yes, but Amazon’s stores will focus on shipping you what you order. While this may sound crazy, other companies actually have similar strategies. One example is Bonobos, the clothing company. When it was founded in 2007, the company sold its clothing exclusively online. But in 2012 it began opening stores called “Guideshops” where you can try on clothes but not buy them. Bonobos doesn’t keep in-store inventory. Rather, it has a warehouse (or multiple warehouses) it ships orders from. In Guideshops you figure out the size of your clothing, decide what color you want, and then Bonobos ships you your order. I think this is similar to what Amazon will do. You’ll be able to buy smaller products (e.g. a cell phone) in its stores, but in many cases, you’ll decide what you want in the store and then Amazon will ship it to you. Imagine this: You go to an Amazon store on your lunch break, you decide to buy a TV, and by the time you get home from work, your TV has been delivered — for free, since you have Amazon Prime. You, the customer, don’t have to carry something heavy when you leave the store, yet you receive the product on the same day. In each of these examples, not only does Amazon’s incredible distribution network make its customers’ lives much easier, but it does so in a way that arguably no other company can. I don’t think any other retailer can offer free same-day delivery at scale. In the original Recode report on Amazon’s retail strategy, Jason Del Rey writes that Amazon wants to merge “the best of physical retail with the best of Amazon”. This is how you do that. From September 1st to December 19th of last year, I studied abroad in Rome, Italy. The experience changed my life for the better. Starting as a complete beginner in a foreign country and leaving it 110 days later able to read, write, and speak basic Italian was one of the hardest and most rewarding things I’ve ever done. Anyone with the chance to study abroad should do it. One of the first things I noticed in Rome was that the iPhone is less popular there than I unconsciously assumed it would be. Coming from the US, where iPhones are extremely prevalent in rich and cosmopolitan areas, I was shocked and confused to see so few of them in Rome. And I didn’t see too many of them elsewhere in Italy, either. In Florence I saw iPhones in the hands of tourists but rarely in the hands of Florentines, and in Todi, a small town in central Italy, I didn’t see a single resident with an iPhone. Today, the iPhone is about one-third as popular in Italy as it is in America. During my time abroad, I noticed three cultural differences that explain some of the gap in iPhone ownership between the two countries. In the US, Apple can negotiate the right to sell iPhones with Walmart, and by signing one contract, the iPhone becomes available for sale at over 3,000 stores that reach over 100,000,000 people. By signing one contract, Apple reaches 100,000,000 people. Repeat this over and over again with other large retailers, and pretty soon, Apple has a massive iPhone distribution network. With relatively few work from Apple, tens of millions of people can buy iPhones in stores. The same dynamic does not apply in Italy. Not only are there far fewer large chains — I don’t remember encountering a single chain comparable to a Target or a Walmart — but, as one of my professors in Italy said, the country is characterized by small businesses, not large ones. John Schmitt, an economist at the Center for Economic and Policy Research, analyzed data from the Organization for Economic Cooperation and Development and found that 46.6 percent of Italian workers are employed by companies with less than 10 employees, versus 11.1 percent of American workers. Conversely, 18.9 percent of Italians are employed by companies with over 249 employees, versus 52.7 percent of American workers. OECD’s data is from 2007, yes, but the picture it paints supports my professor’s assertion from a few months ago. Italy is characterized by small businesses, not large ones. Because of this, there isn’t an “easy” iPhone distribution network in Italy. Apple can’t negotiate with one large company and then all of a sudden tens of millions of people can buy an iPhone in a store. Instead, Apple has to negotiate contracts with thousands of smaller companies to have the same distributional footprint. And even then, there’s no guarantee that the small, neighborhood cell phone store will have a plethora of iPhones in stock. If a storeowner has access to relatively little capital, is he going to invest it in one $835 iPhone, or four $200 Android phones? The lack of an “easy” iPhone distribution network in Italy is one of the reasons the iPhone is about one-third as popular there as it is in America. If Italy had large chains the way America does, Apple would have an “easy” iPhone distribution network in Italy, more people could buy an iPhone in a store there, and the iPhone’s marketshare in Italy would be higher. Before studying abroad, I unconsciously assumed the iPhone would be a status symbol in Italy the way it is in the US. I was partly wrong. In Italy, the iPhone is a status symbol, but it’s less important a status symbol than it is in America. In Italy, a handbag, a messenger bag, a pair of shoes, or a watch are more important status symbols than a phone. If an Italian can afford either a nice bag, a nice pair of shoes, a nice watch, or an iPhone, they are far more likely to choose the bag, the shoes, or the watch than an American in the same situation. In the Italian hierarchy of status symbols, a phone is one of the last things to buy. In the American hierarchy, it’s one of the first. This cultural difference no doubt negatively affects iPhone sales in Italy. The iPhone’s lower placement on the status symbol hierarchy leads to fewer iPhone sales in Italy compared to the US, all other things equal, because less people will buy an iPhone for status reasons. If the iPhone were as important a status symbol in Italy as it is in the US, the iPhone’s marketshare in Italy would be higher. In the US, a base model iPhone 6S, with 16GB of storage, costs $649. In Italy, it costs €779, or $846.48 at today’s exchange rate. In absolute terms, the iPhone costs nearly $200 more in Italy than it does in the US. But that doesn’t tell the whole story. Italy is poorer than the US, both in cumulative and per-person measures. In 2014, the US’s GDP was $17.62 trillion, and Italy’s was $2.141 trillion. In 2012, US median household income was $43,585 and in Italy it was $20,085. So the average household in the US makes around $43,585 and has to pay $649 for an iPhone —1.49 percent of its income. In Italy the average household makes around $20,085 and has to pay $846.48 for an iPhone — 4.21 percent of its income. In relative terms, iPhones cost more than two-and-a-half times as much in Italy as they do in the US! No doubt this explains part of the gap in iPhone ownership between the two countries. If the iPhone cost the same 1.49 percent of household income in Italy as it does in the US, more Italians would buy iPhones, and the iPhone’s marketshare in Italy would be higher. While studying abroad in Rome, I noticed three cultural differences that help explain why the iPhone is about one-third as popular in Italy as it is in America. For one, it’s extremely hard for Apple to create a large iPhone distribution network in Italy because of the country’s lack of chain retailers. Additionally, the iPhone’s lower placement on Italy’s status symbol hierarchy leads to fewer iPhone sales. And when you consider income, the iPhone costs more than two-and-a-half times as much in Italy as it does in the US. These facets of Italian culture hinder the iPhone’s popularity in Italy. It will be fascinating to see if Apple can overcome them. In many ways the Apple Watch untethered me from my iPhone the way the iPhone untethered me from my PC. I was free to leave my phone somewhere in the house, at my desk, or in my pocket, and focus more on the moments of real life. Sometimes it was a meeting, at home, out in my yard, at the kid’s tennis match, etc. There was peace of mind knowing I can leave my phone out of sight or mind but still have access to the relevant information or notifications and even be able to interact and respond to them. The most important interactions and information are no longer only accessible on my large screen smartphone. This experience, of moving key functionality from my iPhone to my wrist, proved to add a significant amount of value to my overall day. Bajarin’s Apple Watch experience is emblematic of others’. Over and over again, people have said Apple Watch liberated them from their phone. This is no coincidence — Apple Watch was designed to free people from their phones. If people use their phones less, Apple is no better or worse off, since Apple profits from selling you an iPhone, not from your use of it. Google, however, is worse off if people use their phones less. People will search less frequently, so Google will show them fewer ads, and the company will thus make less money. This is, from Google’s perspective, the inherent flaw of Android Wear. If it becomes a mass market success, phone usage will decrease, and Google will make less money. App Annie, the app analytics firm, recently released its analysis of the app market in the first quarter. Two statistics in the report have received a lot of press: Last quarter, people downloaded about 70 percent more apps from Google Play than they did from the App Store, yet people spent about 70 percent more money in the App Store than they did in Google Play. That sounds contradictory, but it’s not, and the downloads-revenue fork illustrates the dichotomy in the iOS and Android user bases. If you’ll forgive a brief diversion, a pet peeve of mine is when people analyze the mobile phone market, particularly iOS versus Android, through the lens of Apple versus Microsoft in the 80s and 90s. The issue is not the obvious differences — this time Apple was first, the absolute numbers are much larger, etc. — but rather the fact that many of these commentators simply have their facts wrong. Windows didn’t win because it was open or all the other nonsense that is ballyhooed about; it won because MS-DOS was the operating system for IBM PCs, and at a time when personal computers were sweeping corporate America, “no one got fired for buying IBM.” By the time the Mac arrived in 1984, the battle was already over: businesses, the primary buyers, were already invested in MS-DOS (and, over time, Windows), and not many consumers were buying PCs. Today, of course, the situation is the exact opposite: consumers vastly outnumber business buyers. Thus, the chief reason iPhone/Android is not Windows/Mac is because the market is fundamentally different. In 1984, businesses were the primary customers, and Windows was the default choice. 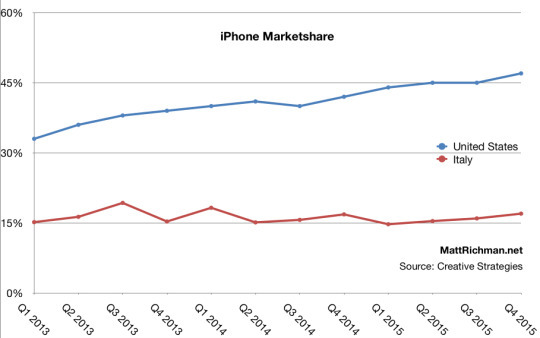 In iPhone/Android, consumers are the primary customers, and iPhone is the default choice. You prefer Android to iOS because Android is “open”. You’re rich enough to buy an iPhone, but you don’t care enough about technology or status (or both) to spend a premium on one. You’re too poor to buy an iPhone. The first reason represents a very small fraction of the market. Most people don’t know the difference between “open” and “closed”, and most people certainly don’t care. The last two reasons, then, are the most common reasons why people buy Android phones. And if you have the money to buy an iPhone but don’t, or if you’re simply too poor to buy an iPhone, you’re probably not going to spend a lot of money on apps. So when App Annie says App Store revenue was about 70 percent higher than Google Play revenue last quarter even though Google Play had about 70 percent more downloads, people shouldn’t be surprised: Apple’s customers are the ones able and willing to spend the most money on apps, so they do. Apple’s business model is self-perpetuating, and the company’s success over the last ten years has set it up do things that no other company can — like anachronize wallets. We can imagine a day in the not-so-distant future when your wallet becomes a remnant of the past. Your passport, your drivers license, and other important documents can be digitally stored in a way that’s safe, secure, and easy to access — but only by you. After all, we shouldn’t have to trade our security for the convenience of having all of this information at our fingertips. In other words, Apple is working today to turn your iPhone into a digital wallet tomorrow. You’ll store your important information in the secure enclave and access it via Touch ID. The combination, as Cook said, is safe and secure, and makes your information accessible only to you. That Apple can imagine wallets becoming remnants of the past is incredibly revealing. It demonstrates grandiose ambition and masterful product management. Wallets have existed for hundreds of years, and Apple thinks it can anachronize them — if that’s not ambitious, I don’t know what is. In 2013, Apple released its first Touch ID-enabled product, introducing people to fingerprint authentication. In 2014, Apple announced Apple Pay, introducing people to the concept of paying for things with fingerprint authentication. And in the not-so-distant future, once people are used to paying for things with their phone instead of their wallet, Apple will reveal how your phone can replace your wallet entirely. The feature rollout is slow and deliberate, and each step builds on the previous one — product management at its best. But as much as Cook’s comments reveal about Apple’s ability to execute on ambitious ideas, they actually reveal something larger and far more important. They reveal how Apple’s success over the last ten years has set the company up to do something no other company can. Only Apple has accumulated the customer trust and cultural influence needed to spark a mass transition to digital wallets. This dynamic applies to more than just wallets, though. Apple’s success over the last ten years has uniquely prepared the company for future success. This is because the company’s business model is self-perpetuating: Today’s success is a foundation for tomorrow’s. And over the last decade, Apple has created many foundations for future success that its competitors don’t have. This disparity will lead to a bifurcation of mobile technology. Apple’s business model is straightforward: It aims to make the best products in the world by designing hardware, software, and services in tandem. Because Apple’s products are meaningfully different than those of its competitors, the company can charge a premium for them, which it invests into making better products. These new products are then sold at a premium, and the company then takes some of that premium to design the next generation of products. It’s a self-perpetuating cycle: The premiums from one generation of products funds the development of the next. Apple’s OEM competitors have a different business model. PC makers like Dell and HP license Windows from Microsoft, and any component that one company uses can also be used by the other. If Dell releases a computer with a screen that consumers are willing to pay a premium for, the company will make some extra profit for a little while, but as soon as HP catches on, HP will purchase the same screen and sell it inside a comparable computer — and at a lower price. So HP will undercut Dell, then Dell will undercut HP, and then HP will undercut Dell again — etc. — until there’s no extra profit to be made from selling a computer with that screen. This dynamic applies to every component consumers are willing to pay a premium for, not just screens. Since PC makers can’t meaningfully differentiate their products from one another, they have nothing to compete on but price. Smartphones are a similar story. OEMs like Motorola and HTC license Android from Google, and any component that one company uses can also be used by the other. If Motorola releases a phone with a better camera that consumers are willing to pay a premium for, Motorola will make some extra profit for a little while, but as soon as HTC catches on, HTC will purchase the same camera and sell it inside a comparable phone — and at a lower price. So HTC will undercut Motorola, then Motorola will undercut HTC, and then HTC will undercut Motorola again — etc. — until there’s no extra profit to be made from selling a phone with that camera. Android OEMs can’t meaningfully differentiate their products from one another, so they have nothing to compete on but price. Over the last decade, Apple has learned how to manufacture complex products with incredible fit and finish at a scale that’s unprecedented in human history. Apple manufactured 34,000 iPhones per hour last quarter, yet iPhones feel nice in a way that few objects, manufactured at any scale, do. This is because of the way they’re made and because of the materials they’re made with. Apple invests in manufacturing innovation and uses premium materials because its goal is to make the best phone in the world, and the nicer your iPhone feels, the better it is. Android OEMs, on the other hand, either don’t make enough money to invest in manufacturing and materials the way Apple does, or they don’t see a return that justifies the investment. iPhones are nicer than Android phones because of Apple’s business model. Gruber wrote that in 2011, and his point stands today. Because Apple buys massive quantities of relatively few components, its economies of scale are larger than any of its competitors’. Apple can sell a product at one price, but if another company was to sell the exact same product, it would have to sell the product at a higher price to make the same amount of money. Together, these are an incredible foundation for future success: Apple can manufacture products that are nicer than its competitors’ products, and because of the company’s massive economies of scales, it can sell them at unbeatable prices, too. Since Steve Jobs returned to Apple, the company has integrated hardware and software better than all of its competitors, but over the last decade, Apple has become the best chip designer, too. It started in 2008, when Apple purchased P.A. Semi. Then, in 2010, it bought Intrinsity. The acquisitions quickly bore fruit. In 2012, Apple released its first phone with a custom CPU core. In 2013, Apple released the first phone with a 64-bit CPU. Then, in 2014, Apple released a product containing the A8, a chip so well designed that it’s denser than the comparable chip made with Intel’s most advanced manufacturing process. Apple can design chips that are better than the chips used by its competitors, and it can customize them specifically for the products they’re used in. As a result, the hardware-software integration that makes Apple products Apple products will grow stronger over time. Over the last decade, Apple has become arguably the best retailer in the world. Apple Stores are in prime locations and are among the most profitable stores on Earth. And the company’s 450+ retail stores are a foundation for future success. The challenge of selling Apple Watch illustrates their foundational nature. Apple Watch is technology combined with jewelry, a product that must be experienced to be fully understood. Jewelers, however, are unequipped to sell technology, and technology retailers are unequipped to sell jewelry. But because Apple has its own stores, the company can redesign them to sell a product that’s a combination of both. Without Apple Stores, there would be no place to properly experience the Watch, so it would have a far smaller chance of success. Apple Stores are a crucial foundation for Apple Watch — and Apple’s competitors have nothing truly comparable. Countless times we hear from global carriers that they prefer Apple’s customers. Apple brings them a lower risk customer with higher credit. Apple brings customers who spend more and thus have higher annual revenues per user. From discussions I have had with retailers looking to support Apple Pay, they make the point that it is iPhone customers they want in their stores. These customers spend more, plain and simple. We see the same reality in the app stores. Apple makes their developers more than 2x the revenue of the Google Play store — with less than half the user base. Amazon’s most profitable customers are on iPhones. Google’s most profitable customers are on iPhones. Carriers [sic] most profitable customers are on iPhones. Even Microsoft is learning their most profitable customers are on iPhones. I could rattle off statistic after statistic that highlights this reality. Apple’s customers are higher value customers and their growing installed base means they are amassing one of the largest, if not the largest, installed base of premium customers on the planet. Today, Apple’s cultural influence and customer base are intimately related: The company’s cultural influence increases its lock on the best customers, and its lock on the best customers increases its cultural influence. Additionally, third parties — software developers, accessory makers, etc. — know that Apple’s customers are the ones most likely to spend money on their products, so they design for iOS first. This, too, is a self-perpetuating cycle: Apple’s customers are the best customers, so third parties prioritize them, which increases Apple’s cultural influence, which draws more people to iOS, giving third parties even more incentive to prioritize it over other platforms. It all comes down to this: Apple can manufacture products that are the nicest and the fastest, sell them in stores its competitors don’t have anything truly comparable to, and at prices its competitors can’t match. This will bifurcate mobile technology. Apple customers will get the best of everything. Apple’s hardware and software will be the best, and they’ll be designed for one another. App developers, accessory makers, and other third parties want Apple’s customers to be their customers, so they’ll design for iOS first. If you’re not an Apple user, you’ll be a second-class citizen. You’ll get a lesser user experience, and third parties will consider you a secondary priority. Apple’s focus on hardware, software, and services is inherently riskier than focusing on hardware, software, or services, as Apple’s competitors do. But Apple’s approach also has more potential. And the coming bifurcation is the result of Apple finally realizing that potential. More merchants are excited to bring Apple Pay to their customers and adoption is strong. Just today, USA Technologies announced they made Apple Pay available at about 200,000 places where everyday payments happen, including vending machines in businesses, airports, and schools, commercial laundry machines in colleges, universities, and laundromats, and parking meters and payment kiosks in lots across the country. Point of sale suppliers tell us they are seeing unprecedented demand from merchants, and all of our partners and customers simply love this new service. With all of this momentum in the early days, we are more convinced than ever that 2015 will be the year of Apple Pay. Apple Pay will succeed for one simple reason: Everyone in the system has an interest in it succeeding. Card issuers like Apple Pay because it reduces their fraud liability. Card networks like it because it reinforces their role in the system. Merchants like that it precludes Target-style data breaches. Everyone has a reason to want Apple Pay to succeed, so it will. How much Apple will profit from Apple Pay is anyone’s guess. Mine is: Over time, a lot. In the U.S. alone, credit and debit card transactions totaled $3.9 trillion in 2013. Since Apple gets a .15 percent cut of every Apple Pay transaction, a measly 10 percent transaction share is worth $585 million. One year, one country, $585 million. Over time, Apple will make billions from Apple Pay. Though Apple Pay will make Apple a ton of money, the strategic implications of the service are worth far more. With Apple Pay, Apple leveraged its business model, cultural influence, and customer base to enter arguably the most heavily-regulated international system on Earth in a way that everyone already in the system had a reason to like. This is an incredible accomplishment, and no other company could have done it. Google does not control Android enough to create anything truly comparable to Apple Pay. Even if Google were able to add Apple Pay’s software components to Android, the company would have to rely on its hardware partners to replicate Touch ID and the secure element and to seamlessly integrate everything together. They’re not going to be able to do that for the foreseeable future. So that’s the strategic significance of Apple Pay — it’s the first time Apple leveraged its strengths to create a highly profitable yet uncopyable service that is destined for success. There’s also been incredible interest in HealthKit, with over 600 developers now integrating it into their apps. Consumers can now choose to securely share their health and wellness metrics with these apps, and this has led to some great new and innovative experiences in fitness and wellness, food and nutrition, and healthcare. For example, with apps such as American Well, users can securely share data such as blood pressure, weight, or activity directly with physicians. And leading hospitals such as Duke Medicine, Stanford Children’s, and Penn Medicine are integrating data from HealthKit into their electronic medical records so that physicians can reach out to patients proactively when they see a problem that needs attention. With HealthKit and the iOS Health app, we believe we’re just at the beginning of amazing new health and wellness solutions for our customers. In other words, Apple is laying the requisite foundations today to announce a healthcare service tomorrow. It’s building relationships with key players, enabling third party hardware innovation through HealthKit, getting people comfortable with iPhones as health repositories, and in the secure enclave and Touch ID, Apple already has a method to store and share healthcare data securely. Over the next few years, Apple will add more sensors to the iPhone and Apple Watch that can be used to measure your health, and third-party medical accessories designed for use with iOS devices will continue to grow in popularity. The healthcare industry will salivate for the resulting data. This dynamic will allow Apple to enter the healthcare field in a number of extremely valuable ways. Insurance companies could subsidize iOS devices to get access to data they’d use to reduce their risks. People could own their medical data and share it with doctors at will. Your iOS device could automatically alert a medical professional if something bad happens. These are just a few ideas, but the possibilities are endless. Like Apple Pay, Apple’s entry into healthcare will be incredibly lucrative. In 2013, U.S. healthcare spending totaled $2.9 trillion. Healthcare systems vary significantly from country to country, but data is valuable in every one of them. This will be worth billions. Not only will it make Apple a ton of money, but Apple’s healthcare service will also be uncopyable for a significant amount of time after it’s announced. No one can copy Apple Pay because no one can integrate hardware and software the way Apple can, and Apple’s health service will take hardware-software integration to a whole new level. Apple reported the most profitable quarter in history last week, but the company is just getting started. Swiss watch makers like TAG Heuer, the biggest brand in luxury goods group LVMH’s watch portfolio, had until recently largely dismissed the threat of “smart” gadgets, but LVMH watch chief Jean-Claude Biver says he had changed his mind on the subject. Biver, who had already outlined plans for a smartwatch, said he had struck several partnerships and was mulling purchases to help come up with an original upmarket offering. TAG Heuer’s smartwatch won’t sell. There’s no market for it. Apple Watch requires pairing with an iPhone, and TAG’s smartwatch will need to pair with a smartphone to even have a chance of being as feature-rich as Apple Watch. Apple isn’t going to re-engineer iOS for TAG’s benefit, so TAG’s smartwatch won’t pair with an iPhone the way Apple Watch does. In order to have even a chance of being as feature-rich as Apple Watch, then, TAG’s smartwatch will have to pair with an Android phone. However, TAG wearers aren’t Android users. Rich people buy TAG watches, but rich people don’t buy Android phones. This is TAG’s dilemma. Its smartwatch will need to pair with an Android phone to be anywhere near as feature-rich as Apple Watch, but TAG wearers don’t buy Android phones. Ultimately, this dynamic is representative of the entire luxury watch industry. Replace TAG with Rolex, Omega, Longines, or any other high-end watchmaker, and the problem is the exact same. A Rolex smartwatch would need to pair with an Android phone to be anywhere near as feature-rich as Apple Watch, but Rolex wearers don’t buy Android phones. An Omega smartwatch would need to pair with an Android phone to be anywhere near as feature-rich as Apple Watch, but Omega wearers don’t buy Android phones. A Longines smartwatch would need to pair with an Android phone to be anywhere near as feature-rich as Apple Watch, but Longines wearers don’t buy Android phones. None of their smartwatches would sell. There’s not a rich-people-who-use-Android-and-buy-luxury-watches market. Over the next decade — as Apple Watch’s “computer on a chip” becomes more powerful, as voice input becomes more useful, as Apple executes more of its health and smart home plans, as people recognize Apple Watch’s convenience — almost all watches will become smartwatches, similar to how all cell phones are becoming smartphones. The luxury watchmakers who make smartwatches will fail, because there won’t be a market for their products. But the luxury watchmakers who don’t make smartwatches will see their market continuously shrink. They’re damned if they do and damned if they don’t. This, I believe, is why Jony Ive said, “Switzerland is fucked”. Copyright © 2011-2017 Matt Richman. All rights reserved.